JEFFERSONVILLE, Ind. 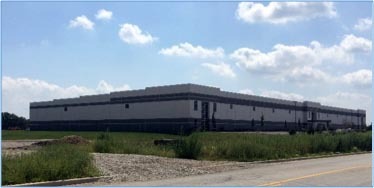 (Sept. 3, 2014) – America Place, a commercial real estate developer in the Louisville-Southern Indiana region, welcomes automotive supplier Tenneco Inc. to its new home on its expanding campus at River Ridge Commerce Center. Tenneco has leased a 150,000-s.f. building on the America Place campus, where it will initially employ more than 250 workers. The building is designed for expansion as Tenneco’s local operations grow. America Place already has begun construction on an adjacent building more than one-and-a-half times the size of Tenneco’s initial facility. America Place is investing $75 million to $100 million to develop at least four more buildings on its 86-acre campus to meet the growing demand for logistics-driven manufacturing facilities. When completed, the campus will include more than 1 million square feet and serve as home to employers with about 2,500 jobs. Tenneco Inc. (NYSE: TEN) is an $8 billion global manufacturing company with headquarters in Lake Forest, Ill., and approximately 26,000 employees worldwide. Tenneco is one of the world’s largest designers, manufacturers and marketers of clean air and ride performance products and systems for automotive and commercial vehicle original equipment markets and the aftermarket. Tenneco’s principal brand names are Monroe®, Walker®, XNOx™ and Clevite®Elastomer. This entry was posted in Jefferson County PVA News, Kentucky-Wide News, Louisville-Jefferson County News, Website News.